ALL NATURAL--100% natural materials, great for playing and nibbling, help your lovely pet stay from boredom. Suitable for rabbits, bunny, guinea pigs, hamsters, gerbils, chinchillas, rats, and other small animals. ENVIRONMENTALLY FRIENDLY--The grass ball made from natural timothy grass and much better than other plastic or artificial rabbit toys. GOOD FOR DENTAL HEALTH --Growing pets need things to chew. chewing furniture, carpet and anything they can get. Use Timothy grass ball not only for pet\'s optimal oral and dental health but also to stop them from ruining your furniture. 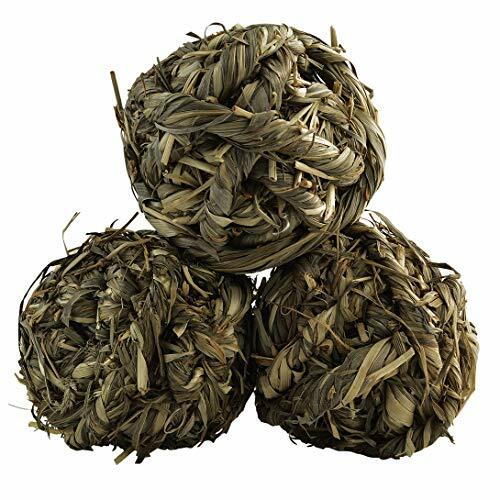 RELIEVE ANXIETY--Grass Ball especially designed for the purpose to relieve anxiety or stress of the pet. still happy when they are alone.an ideal toy for all pets. SIZE--Diameter approximately 3.5 inches, this ball is made from natural Timothy Grass. harmless to pets. It\'s very fun for rabbits, guinea pigs and other small animals, as they can easily get their teeth around it!